I did this project last year when I taught Joy School for my second daughter. The kids loved it and had tons of fun putting these together. The parents loved it and I had friends asking for instructions once I posted the picture on Instagram. So I thought I better share it this year since there is some more time. 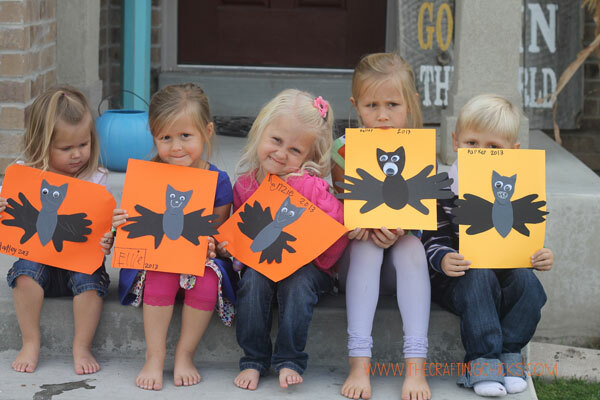 These would be perfect for kids in a classroom, or just for a fun craft with your kids. First off you will need the bat template. Download below (and don’t mock the drawings, I did it myself). Print on heavy card stock if you plan on tracing a bunch of these. I just save my template from year to year in my Halloween storage containers. 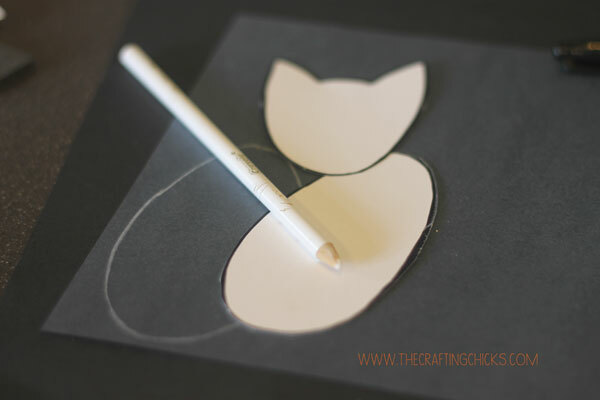 Cut out your template and trace it onto black paper. 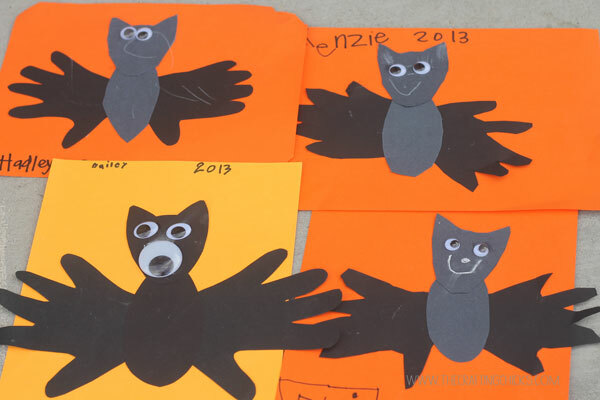 Next,trace the children’s hands on the black card stock. Cut everything out, or let the kids have a turn cutting. I let my 7 year old do most of the cutting and she loved having a job. Take the hands and turn them over so any white won’t show on front. I like to turn my thumbs down cause I think it makes the wings look better. Use the glue stick to glue the hands to the back of the bat body. Then glue the head onto the body overlapping a bit onto the body. Let them add the googley eyes and any other features they think their bat needs. 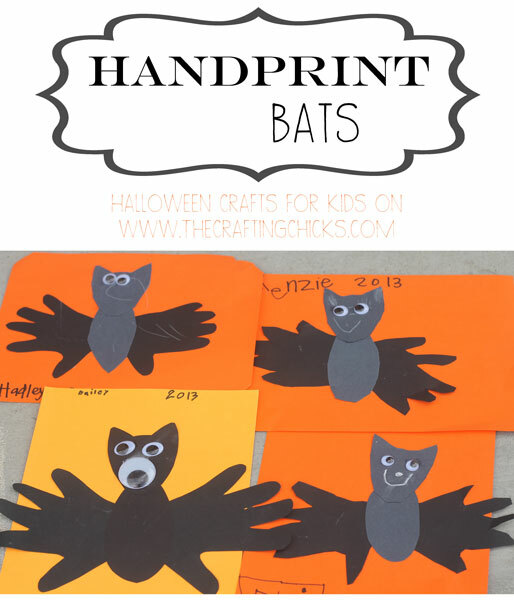 Glue everything onto your orange paper and you now have some spooky bats to decorate with. They sure had fun with this. I bet the kids in your life would too. 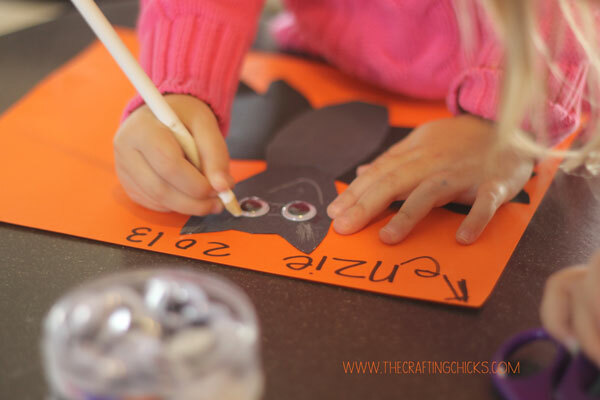 Make time to craft with them this Halloween. 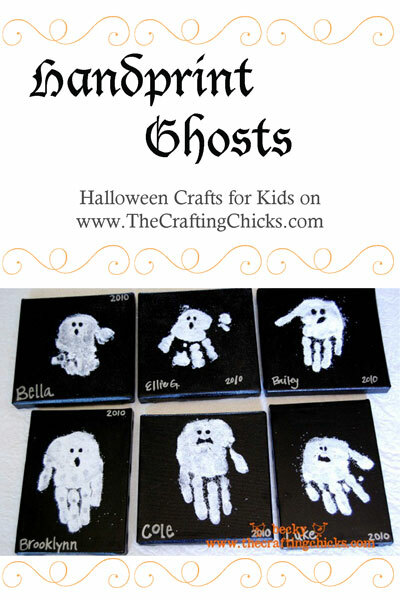 You can always make sure to check out my Ghost Handprints if you are looking for another Halloween Kid Craft. These are so cute! this is exactly what I need for my 4-year old who gets bored a lot. I need people like you in my life. I don’t have a craft bone in my body. Thank you! Any chance you can save the file as a PDF? I don’t have a program that will open a .PSD file. Is there any way you can upload the template again? Hi Amber. The template has been uploaded again. Sorry about that. Thanks!